Coverage: Build-up and live commentary on BBC Radio 5 live from 13:00, with text updates and pinstickers' guide on the BBC Sport website and app. 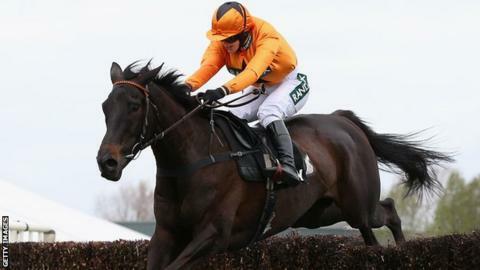 Lizzie Kelly guided the 10-1 shot Tea For Two to victory in the Betway Bowl on the opening day of the Grand National meeting at Aintree. Kelly was unseated at the second fence on the horse in March's Cheltenham Gold Cup, leaving her distraught. But this time they got the better of last year's winner Cue Card for a second Grade One success. They pulled alongside Cue Card with three to go and showed good strength to win by a neck after an epic battle. "I just wanted him to run well and confidently and give me what I feel he is capable of," Kelly told BBC Radio 5 live afterwards. "I thought the others would come back at me in the final stages so I just wanted to keep my momentum. "I don't think I'm the nation's favourite person having beaten the nation's favourite horse [Cue Card]." The 23-year-old also admitted that her truncated Gold Cup experience, where she became the first woman since Linda Sheedy in 1984 to ride in the race, had been "character-building". "I was just so disappointed because there is such a build-up and then, bam, you are out of it," she added. "But that's racing. Sometimes you have good days and sometimes you have bad days. "It's difficult to pick yourself up from being that low but I had to get back into the weighing room and things are forgotten quickly and you are on to the next race. You don't get a chance to dwell on it. "I'm the only jockey to have ridden Tea for Two in a race so to see him running around Cheltenham without me was unnerving. "When we got home, he was very subdued and I think it has done him the world of good because he has learned if he doesn't listen to me, things will go wrong." Kelly shot to fame when she became the first female jockey to win a Grade One jumps race in Britain when she guided Tea for Two - part-owned by her mother Jane and trained by her stepfather Nick Williams - to victory in the Kauto Star Novice Chase at Kempton in December 2015. "This [the Betway Bowl] means more than winning the Grade One at Kempton on him," she added. "I didn't really appreciate that at the time, but this is special." Kelly's mother Jane, who does much of the work with the horse, told BBC Radio 5 live that Thursday's race had been an anxious experience. "I spent three-quarters of the race in the car park trying to hide," she said. "We had such disappointment at Cheltenham. It's hard when you expect a big run, to come crashing down at the second. "We scraped ourselves off the floor that day. The horse has been doing a lot of dressage and has been very well." Of the beaten horses, Cue Card's assistant trainer Joe Tizzard said the horse, who is now 11, will continue in training next year but Paul Nicholls's veteran campaigner Silviniaco Conti who finished sixth, has been retired. This is notable result anyway, with Tea For Two establishing himself amongst jump racing's elite by defeating Cue Card, no less. But this thrilling finish - they went head to head from the third last of the 19 fences - was also a really good sporting story. Twenty days after the tide of hype around his jockey being the first female to ride in the Gold Cup in decades came to a grinding halt on the turf at Cheltenham, the popular pair spectacularly re-discovered their mojo. And they also won on a left-handed track for the first time. Only eight, Tea For Two is a top-flight contender for the future. Champion Hurdle winner Buveur D'Air looked impressive as he claimed a third Grade One success with victory in the Betway Aintree Hurdle. Running for the first time over two-and-a-half miles, the 4-9 shot, ridden by Barry Geraghty and trained by Nicky Henderson, beat stable-mate My Tent Or Yours by five lengths. It was a third Grade One win for the six-year-old who took the lead from The New One at the second-last and powered on to victory. "He did that really well, he was obviously back in his Cheltenham form and Nicky has done a great job to get him back so soon," said Geraghty, who missed the Cheltenham Festival because of injury. "He's a very good horse. He's sharp, he's buzzy - he's a proper two-miler really." What are the highlights on Aintree Ladies Day on Friday? After finishing second in their respective races at the Cheltenham Festival, both Fox Norton and Sub Lieutenant will hope to go one better in the Melling Chase (15:25 BST). The Colin Tizzard-trained Fox Norton was beaten narrowly by Special Tiara in the Queen Mother Champion Chase but steps up in trip for the 2m 4f race while Sub Lieutenant, from the Henry de Bromhead yard, was edged out by Un De Sceaux in the Ryanair Chase. The pair are part of a field of nine for the race and last year's winner God's Own, who saw his Champion Chase hopes disappear with two bad mistakes, will aim for back-to-back wins for trainer Tom George. Jockeys will get a final chance to experience the Grand National before Saturday's big race in the Topham Chase (16:05).